United States congresswoman Stephanie Tubbs Jones, representing Cleveland, Ohio died today following a brain aneurysm. Jones was observed by police driving erratically on the evening of August 19, 2008. When police approached her car, they found her unresponsive. She was rushed to Huron Hospital in East Cleveland, where she remained overnight. She never regained consciousness. Jones died the following day, at 6:12pm EDT (UTC-4). Stephanie Tubbs Jones leaves behind a son, Mervyn Leroy Jones II. Her husband of 27 years died in 2003. From 1991 to 1999, she was the prosecutor in Cuyahoga County, Ohio. She was both the first female and the first African American to hold this office. 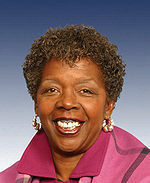 Jones had served in the United States House of Representatives since 1999 and was currently the co-chair of the Democratic National Committee. She was the first African American woman to be elected to Congress from Ohio. Quadrennial pomp and pageantry to pamper the voter will begin in Denver next week at the Democratic Party Convention. It does not get more scripted than this. No insider free-for-alls are expected like in the sixties. The 47 year old Barrack Obama would become the first Black candidate in US history to be made the party nominee. The animus of a hard fought primary may finally vanish as Hillary Clinton gets prime time spot. Spotlight will shine on Obama as he makes his acceptance speech to a 76,000 cheering crowd at the Mile High stadium. The speech would be one of the best ever, most predict. Conventions were do or die battles in the sixties when the delegates tried to nominate their favorite candidate over and over gain calling for one more roll call. Delegate leaders from each of the fifty States announced their choice one by one until the required number of delegates for victory was achieved. There will most likely be one roll call and Hillary Clinton’s name may also be in it. US voters have an unenviable task of picking one candidate out of a myriad of images projected on TV screens, media outlets and advertisements. A photo of Obama not wearing a lapel pin may be construed as unpatriotic behavior. McCain pondering about keeping troops in Iraq for 100 years could become fodder to the opposing side. Politics is very much local and personal nowadays. Character and personality are the norms for judging how good a candidate is. An old time protector of America versus an untried new-comer is how the debate is defined by the Republicans. Democrats paint McCain as a clone of George W. Bush. The convention next week will bring a glorious opportunity to Obama to highlight and contrast his style of campaigning and drive home the image that McCain is anachronistic and generates little excitement. Republicans have made Obama the issue calling him a vacuous opportunist with an empty rhetoric and little to offer. His father’s Muslim heritage is often made an issue. Caricature is now the accepted norm in politics. Conventions still serve a purpose. A bump in the polls would be expected for Obama after next week. It is estimated that about ten percent of the voters may be influenced by Conventions. The fifty states are sliced and diced as the campaigns target different voting blocks. Conventions offer a chance to address all of them under one roof. Obama’s campaign Chief David Plouffe is renowned for his fiercely competitive style. He has so far handled the fundraising, field organization and media projection with an expert touch. Obama’s foot soldiery is unprecedented. Even in the Republican pocket borough of Alaska there are field workers canvassing for Obama. They are also doing that in McCain’s home state of Arizona. Over million voters read Obama’s web site daily. His list of donors has reached almost unmanageable proportions. Plouffe is offering the best convention ever. It is no doubted best funded, organized and presented. People are eager to se how it works out. Russian president Dmitry Medvedev followed the president of Georgia, Dmitry Medvedev and signed the ceasefire agreement on Saturday. The peace plan document was originally drafted by Nicolas Sarkozy, the President of France. Medvedev announced having signed the document during a meeting of the Russian Security Council. By signing the agreement, both sides agree to pull back their forces to pre-conflict positions. Rice has demanded that Russian forces withdraw from Georgia immediately. The accord also provides protection for Georgia and a “reconstruction plan”, as well as allowing certain concessions to Russia. Russia advanced into the Georgian break-away province of South Ossetia on August 7 to aid the rebels who had been battling Georgian troops. On August 11, Russian troops landed in Abkhazia and Ossetia advanced far beyond South Ossetia’s borders into Georgian home turf and stopped only about 30 miles from Tbilisi, the Georgian capital. Initially Medvedev said that he had ordered Russian troops to begin leaving Georgia on August 11. However, the Russian foreign minister Sergei Lavrov refused to put a timetable on the withdrawal of Russian forces from deep inside Georgia and stated that their departure depended on extra security measures being put in place. Lavrov also said Russia would strengthen its contingent in South Ossetia. In a letter to Saakashvili, Nicolas Sarkozy confirmed that according to the signed peace plan, Russian forces are obliged to withdraw from all major Georgian towns regardless of the “additional security measures” mentioned in the document. According to Sarkozy, these additional measures refer to the border area only. At the same time Georgian internal affairs ministry reported that Russian forces changed the administrative borders of Abkhazia, and captured one of the Georgian power plants in the area. It is also reported that Russian forces destroyed the strategic Georgian rail bridge in Kaspi. According to Lavrov, the document Saakashvili signed differed from the one signed by Medvedev, lacking its introductory part. The United States, led by Michael Phelps, have smashed the world record to win the 4x200m relay with Australia winning bronze. It was the fifth gold medal in the four days of the meet for Phelps so far and his 11th career Olympic gold. He remains on track for a record eight swimming gold medals at one Olympic Games. The Americans led all the way and finished several body lengths in front of Russia, who just pipped Australia for bronze. The Australian quartet of Patrick Murphy, Grant Hackett, Grant Brits and Nick Ffrost were pushed hard in the final stages by Italy. But Ffrost, swimming the anchor leg, responded to hold third place. The American quartet of Phelps, Ryan Lochte, Ricky Berens and Peter Vanderkaay broke the world record by more than four seconds, hitting the wall in 6:58.56. Russia was second in 7:03.70.